Hello! I happened upon the July 7th issue of Rolling Stone magazine in the supermarket this afternoon! I scanned the band photo, and added to the gallery here. I was hoping that the quality of the photo in the magazine would be better than the image I got from Rolling Stone’s web site, but it isn’t really. :( Oh well, awesome new photo and interview!! Hello! 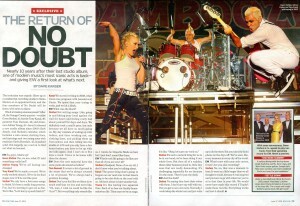 No Doubt is featured in the July 7th issue of Rolling Stone magazine! I didn’t see it on newsstands yet today, but I was able to grab a copy of it on RS’s online subscription site (yes, I re-subscribed to Rolling Stone just so I could get this image). Please click on the thumbnail to the left for a larger image. I’ll upload a scan of the article as soon as I can get my hands on the actual magazine. Also, Stylist magazine posted a great new interview with Gwen on their site. Must read! “On June 7, Gwen Stefani hosted a private Harajuku-themed tea party at Royal/T to benefit Save the Children’s Japan Earthquake-Tsunami Children in Emergency Fund. Guests were treated to a surprise performance by No Doubt. 200 lucky fans enjoyed a personal meet and greet with Gwen at Royal/T, Los Angeles’ first-ever Japanese-style “cosplay” maid café and pop art space. Other special guests included her No Doubt bandmates Tom Dumont, Tony Kanal and Adrian Young, and husband Gavin Rossdale. Gwen’s former muses Love, Angel, Music and Baby were also on hand alongside Royal/T’s “maid” servers. The event included a raffle featuring collectible vintage L.A.M.B. memorabilia from Gwen’s own closet, Harajuku Lovers fragrance sets and other merchandise including UK-based Momiji message dolls. “Gwen’s Save the Children event was a beautiful evening. Not only could we do our small part in the effort to raise funds for those affected by the Japanese earthquake and tsunami, we got to play an extremely fun and intimate surprise live set for the very generous fans that donated a lot of money for a great cause,” said No Doubt’s Tony Kanal. Following the devastation caused by the recent earthquake and tsunami in Japan, Gwen personally donated $1 million to Save the Children. To raise additional funds she hosted the Harajuku-themed tea party at Royal/T for 200 loyal fans and helped to raise nearly $120,000 more for the charity and their relief effort. Generous vendors who donated services for the event included UK-based Momiji, Eric Buterbaugh Flower Design, Lauren Hillary Photography, Rony’s Photo Booth, Valet of the Dolls, and Classic Party Rentals. All funds will go to Save the Children’s Japan Earthquake-Tsunami Children in Emergency Fund. A high tea was provided by Royal/T. See photos from the event HERE.On June 7, Gwen Stefani hosted a private Harajuku-themed tea party at Royal/T to benefit Save the Children’s Japan Earthquake-Tsunami Children in Emergency Fund. Guests were treated to a surprise performance by No Doubt. I’ve also added it to the gallery here. No new photos, but it’s still an awesome article! They allowed the journalist to listen to, and describe two of the new songs, “One More Summer” and “Settle Down”! I can’t wait for more and more of these articles to pop up now that we’re getting closer to the album release! I really want to see the new photos that Tom tweeted about, too! No Doubt to be in the next issue of EW! It has been nearly 10 years since No Doubt dropped their last studio album, Rock Steady; five years since singer Gwen Stefani dropped her last solo album The Sweet Escape; and two years since the group reunited for a big summer tour. 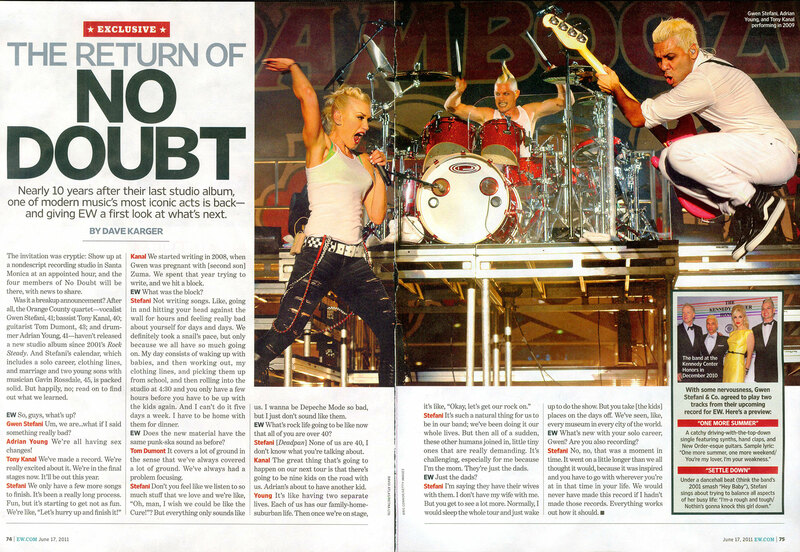 But Job-like No Doubt fans are about to be rewarded: Stefani, guitarist Tom Dumont, bassist Tony Kanal and drummer Adrian Young sat down with Entertainment Weekly in Santa Monica this past weekend to chat about where they’ve been—and where they’re going. And while we’re keeping the big news a secret for now (you can read the whole interview in this week’s coming issue, which is on newsstands this Friday), Stefani did tell us that the days of her being a solo artist are probably over. Awesome! I hope this is a full cover story with a photo shoot! Eeep! It will hit the newsstands this coming Friday! I have a subscription which is due to run out any time now. I hope not before I get this issue in the mail! You are currently browsing the Greener Pastures – a No Doubt fan site archives for June, 2011.